Easter is just around the corner! 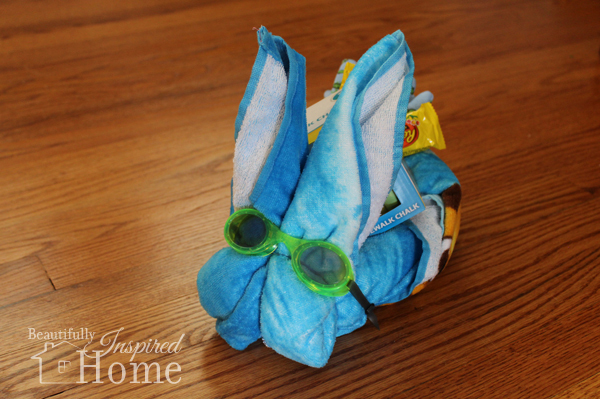 I wanted to share with you this adorable Towel Easter Bunny Basket. It is a simple project and a great way to give a useful gift. 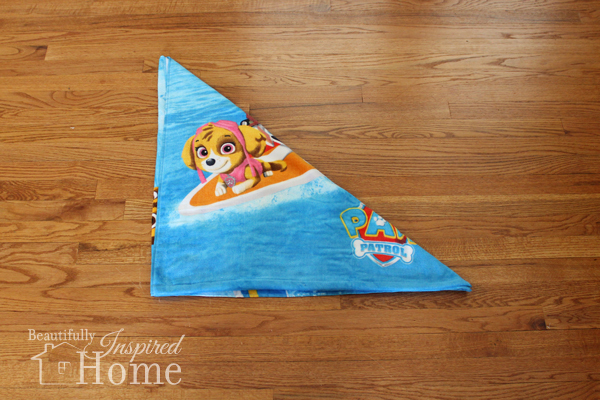 I have two active nephews who will love a jump start to summer! Please Note: Some of the links below are affiliate links for products I love! If you decide to click on one of these links and make a purchase, I may earn a commission at no extra cost to you. Thanks for your support! 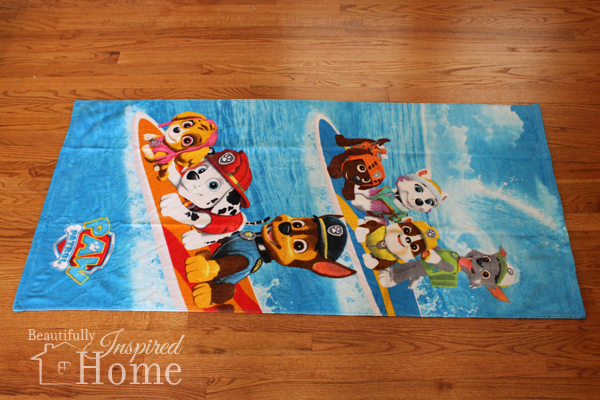 I started with a 28×58″ character towel. 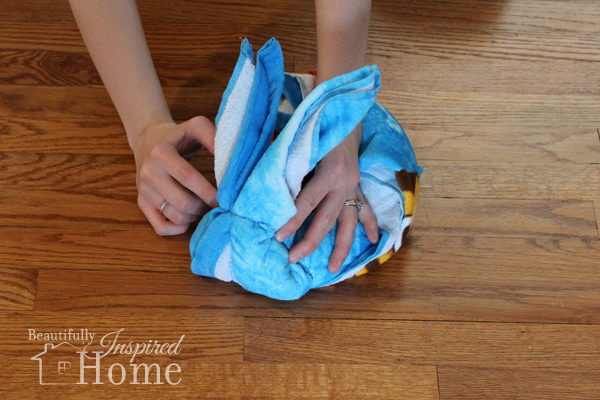 These towels are thinner than your solid color beach towels. 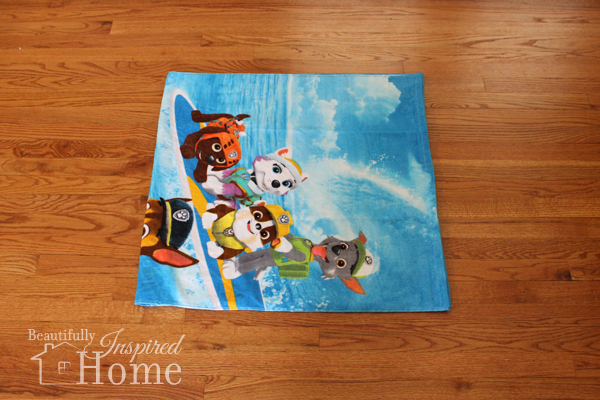 If you get a thicker beach towel make sure it is bigger so the proportions are similar or you may have a chunky bunny. 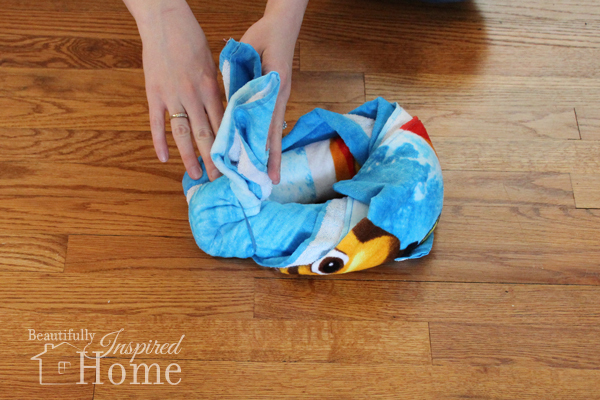 Fold the towel in half, bringing the two short ends together. Line the edges up as closely as possible. 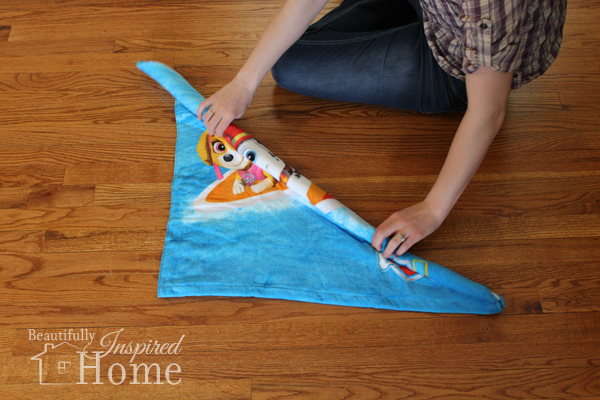 Next fold the towel in half corner to corner. You want to choose the corner with the tags to meet another corner. The top and bottom right corners will soon be the bunny ears and you don’t want tags sticking out of them. You can also just cut the tags off and solve this problem as well. 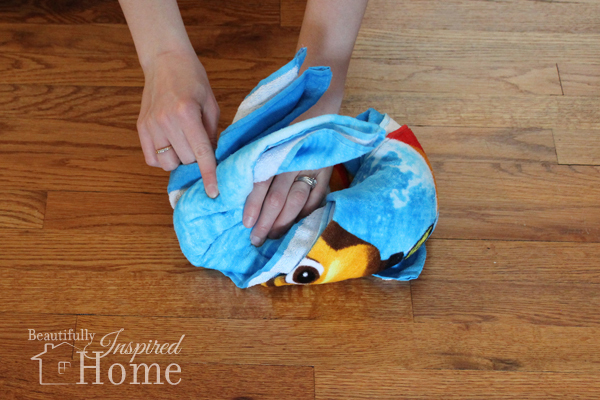 Starting on the long side you just folded start tightly rolling the towel. 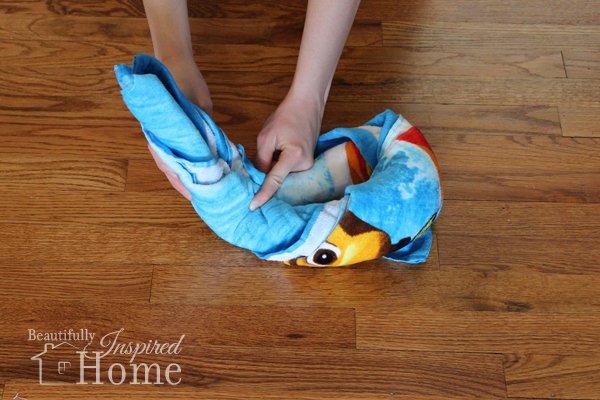 Bend the towel in half. Have your rubber band handy at this point. 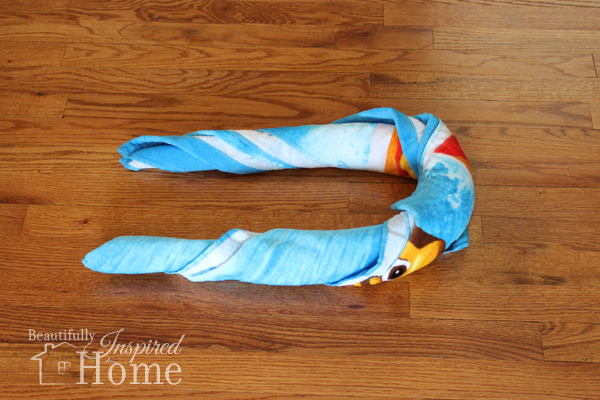 Take the two ends and bend them in half towards your first bend. The fold you just made is where you will put the rubber band over. Place the rubber band about 2 inches over the fold. This is now the face of your bunny. Hold the face and bend the ears forward toward the face. Fiddle with the ears until they stand how you want them. If they are too floppy move your rubber band up to shorten the ears. 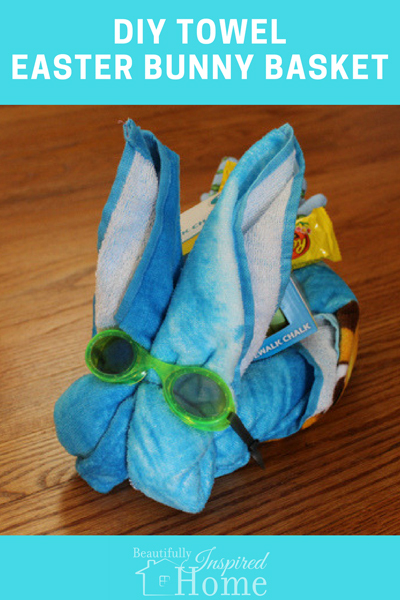 Next add the swim goggles or sunglasses to complete the face of the bunny. 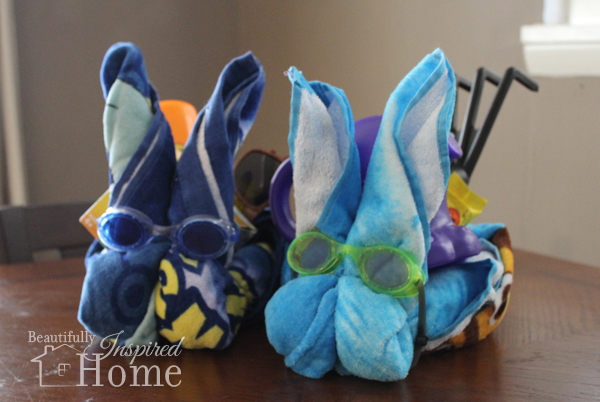 For goggles place the head band under the bunny so they will hold tight. For sunglasses just fold the sides behind the ears. Your bunny is now ready to fill with goodies! FYI the bunny is just a ring so the items are just tucked into that ring. When picked up items may fall through. If you want to keep that from happening add a little box or bag to the ring to keep items together. I didn’t find this was necessary as the bunnies were quickly emptied of items and played with. Hi, I’m Morgan and welcome to my creative home! I am an event planner by day and a crafter and DIYer by night. I am passionate about making beautiful things and teaching others how they can too. Join me as my husband and I turn our new house into our Beautifully Inspired Home. I just made this for my 2 grandkids. I’m sure they are going to love them. easy to make. too bad I can not post a picture. Hi Carmen, I would love to see a photo of your bunnies! Can you email me your photo to [email protected]? I would love to see how it came out and maybe even feature it! I looooove this idea! Sadly I already have a pressie for my goddaughters for this year. But I’ll be saving this idea on pinterest for next year for sure!!! What an absolutely DARLING and CLEVER idea, Morgan!!!!!! Loooove it!! I wish I’d seen it soon enough to order the towels! This idea is timeless, though, so I will save it for next year, as I know my grandsons would LOVE this!!!!! Right before summer, too!!! Thank you so much for sharing this cute idea! My daughter is having her birthday party at the beach in May. 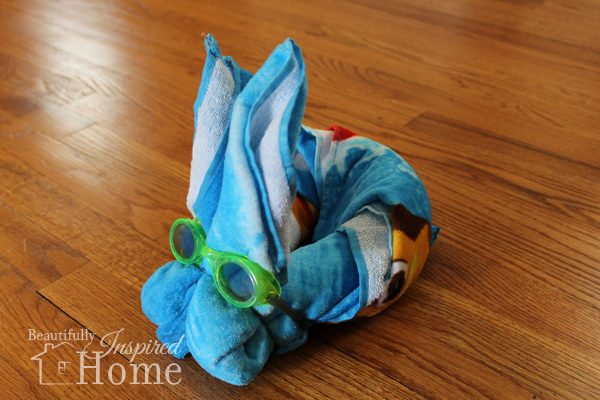 The beach towel bunny is the perfect party favor for a beach party! AND so easy too! Perfection! [email protected],What a cute idea , I will be making these for my grandkids.